April 12-13-14 | Portland, Ore.
April 15 | Patterson Baseball Complex and Coach Steve Hertz Field | Spokane, Wash.
- Gonzaga won the bookends of a three-game home series with Pacific. - After a 9-7 GU win on Friday night, the team's traded shutouts in the final two games. - Starter Mac Lardner threw 7.0 scoreless innings and combined with Alek Jacob for a 3-0 Sunday shutout. Jacob saved both GU wins in the series. - Gonzaga relief pitcher Alek Jacob has been the jack of all trades for Gonzaga this season. - Starting out the year as a starter, but converting to the closer due to need, he has racked up seven saves, leads the team with three wins, and has 44 strikeouts in 42.2 innings pitched. - Jacob is holding opposing hitters to a .187 batting average and has a 2.11 ERA on the year. - JuCo transfer 3B Brett Harris had eight hits (.444) across four games two weeks ago and then added a three-run homer -- his first as a Zag -- against Pacific on Friday. - Harris' biggest game came in the series finale against San Diego with two doubles, four RBI and two walks. He got the Gonzaga rally started in the ninth inning with the team down by three when he ripped a two-run double to left, and GU went on to win in walk-off fashion. - He also had a 3-for-4 day in GU's midweek win over Washington with a double, RBI and run scored. - Harris had one hit against San Diego on Friday, then had two and a run scored in a 15-3 win on Saturday. - Ernie Yake is currently leading the nation in the "Toughest to Strikeout" category, going down on strikes just four times in 111 at-bats on the season. - He's also third on the team with nine walks on the year. - Gonzaga has played in four extra-inning games this season and is 3-1 overall. - Gonzaga is 4-2 in the last six games, and after starting the year 2-6, has gone 12-8 since. - GU is 5-2 at home and 8-9 in true road games. - Gonzaga has 63 doubles to just 35 for opponents, but has 13 total homers compared to 33 for opponents. - Gonzaga is also good at taking pitches, getting HBPs 40 times in 25 games. - GU has also struck out 37 less times than their opponents in total on the year - 197-160. - Gonzaga has at least seven hits in 18 of its last 21 games, including at least 10 in nine of those games. - Ernie Yake and Brett Harris have been the most clutch hitters for GU, with Yake going 11-for-29 (.379) and Harris going 10-for-24 (.417) with runners in scoring position. - Johnston leads the way with 19 RBI on the season, while Nick Nyquist has 18 and five others have at least 14. - Guthrie Morrison has reached base in each of the last 12 games, while Brett Harris has been on base in seven in a row. - Morrison's hit streak is at seven games, while Nick Nyquist has a hit in each of the last five. - Mason Wells and Daniel Naughton have been moved into a starting roles as freshmen and has responded nicely. - Wells has started four games and compiled a 4.18 earned-run average, while holding hitters to a .186 batting average. - Wells went 5.1 innings against BYU and gave up just one earned run at BYU, and then threw an 8.0-inning complete game in a two-run loss at Pepperdine, allowing just four runs on four hits. 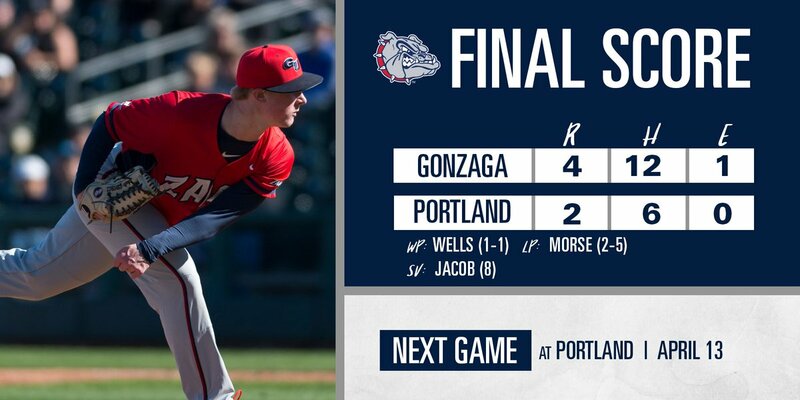 PORTLAND, Ore. — Gonzaga baseball continued its hot streak against Portland with its 10th straight win over the Pilots, 4-2, on Friday night in Portland, Ore. The Zags (15-14, 8-5) got a solid start from freshman lefty Mason Wells with 7.0 innings, allowing just two runs on four hits with four strikeouts, and Austin Pinorini came through with a two-RBI triple in the seventh to beat the Pilots (20-15, 2-11). Wells gave way to closer Alek Jacob in the eighth and the GU right-hander was dominant, going 2.0 innings for his eighth save of the season. He allowed just two hits and struck out four. Yake had homered three batters before Pinorini came up to tie the score at 2-2. Nick Nyquist had three hits, and Johnston and Daniel Fredrickson each had two to pace the offense. The squads traded first inning runs and then went scoreless through the next four innings with both starting pitchers settling in. Portland got one in the bottom of the sixth, but the Zags came right back with three of their own in the seventh. After the first two got out, Yake came through with his solo homer over the left field fence to tie it at 2-2. Guthrie Morrison and Troy Johnston then both reached to bring Pinorini to the plate, and the senior came through with a triple and a two-run GU lead. Gonzaga and Portland will play the second of a three-game series Saturday evening at 6 p.m. Links to live coverage will be available at GoZags.com. Last edited by TerpZag; 04-13-2019 at 09:36 PM. Zags win with a big offensive outburst and solid start from Spellacy. 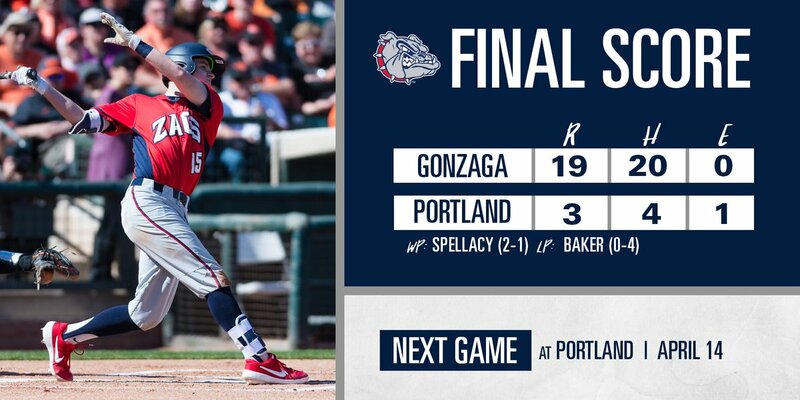 PORTLAND, Ore. — Gonzaga baseball got the bats going to the tune of 20 hits in a 19-3 win at Portland on Friday (?) (Saturday) evening. "Our guys did a good job of securing a conference series win on the road," head coach Mark Machtolf said. "It was a huge effort offensively 1-9 in the lineup. Michael Spellacy did a nice job of pounding the strike zone and pitching with a lead. We need to turn the page quickly and come out looking for a sweep tomorrow." The win clinches the series with Portland (20-16, 2-12) and will put GU (16-14, 9-5) on the field on Sunday with a chance at a sweep. Alongside the offensive outburst, GU starter Michael Spellacy went 6.0 innings, allowing just one run on three hits with four strikeouts. The top of the Gonzaga order did the most damage, collecting 13 hits in the first five spots in the lineup. Guthrie Morrison, Troy Johnston and Austin Pinorini each had three hits, while Ernie Yake had four RBI and Nick Nyquist and Daniel Fredrickson had three RBI each. GU had nine extra-base hits in the game and reached base another nine times via walks or hit-by pitches. Gonzaga broke the game open in the second with five runs, then added five more in the fourth inning to take a commanding lead. Already up 1-0, GU got a two-run homer from Nick Nyquist followed by back-to-back RBI singles from Yake and Pinorini. Then in the fourth, Johnston had an RBI double and Yake added another RBI single sandwiched around a bases-loaded walk and fielder's choice that each scored runs. GU added a single run in the fifth on an RBI double from Daniel Fredrickson, and then added another on an RBI double in the sixth by Jace Vandebrake. Ryan Sullivan added a three-run homer to cap the scoring on the day. It was his team-leading seventh of the season. Gonzaga and Portland will wrap the series on Sunday at 1 p.m. Links to live coverage will be available at GoZags.com. Sweep! Zags win in 11 to go 3-0 in Portland. 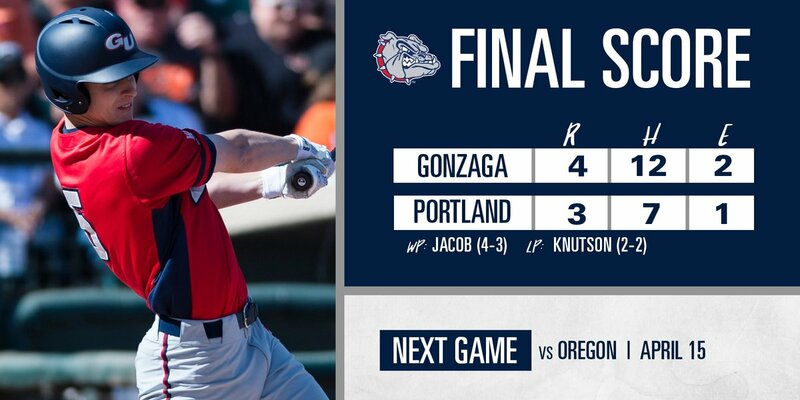 PORTLAND, Ore. — Gonzaga baseball got a clutch hit out of Guthrie Morrison in the 11th inning to finish off a weekend sweep of the University of Portland by a Sunday score of 4-3 in Portland, Ore.
Gonzaga (17-14, 10-5) took a 3-2 lead to the ninth inning, but Portland (20-17, 2-13) forced extra innings with a run. That set the stage for Morrison, who deposited a single into left center to score Ernie Yake from second. Reliever Alek Jacob then shut down the Pilots in order in the bottom of the 11th to get the win. "That was a really gritty Sunday win," head coach Mark Machtolf said. "We played tough baseball in all three phases, Guthrie [Morrison] had a couple big-time defensive plays and came through with a big hit. We'll enjoy the trip home and be ready to face the Ducks tomorrow." Troy Johnston had a monster day at the plate, going 4-for-5 with a double and an RBI. Morrison had three hits, a run and an RBI, and Ernie Yake had two hits and scored twice. On the mound, Mac Lardner turned in a third straight solid outing, going 6.0 innings, allowing just two runs on five hits with nine strikeouts and two walks. Jacob went the final 5.0 innings and gave up just one unearned run on two hits with five strikeouts and two walks. Gonzaga jumped out to a 2-0 lead in the third inning, starting the frame with three straight singles by Yake, Morrison and Johnston. The last of the three hits knocked home Yake for the game's first run. GU added one more on a sacrifice fly by Brett Harris. Portland came back with a two-run homer by Cody Hawken in the bottom of the third to tie the score. That was it until the eighth inning when the Zags got to the Pilot bullpen. In that eighth inning, Harris walked to start, moved to second on a sacrifice bunt and advanced to third on a single by Nick Nyquist. Harris scored on a bunt by Mason Marenco for the go-ahead run. In the ninth, Portland put two runners aboard with two outs, the second reaching on a catcher's interference. A single to left tied the game and pushed it to extras. Gonzaga travels home to face Oregon on Monday in Spokane, Wash. The first pitch is scheduled for 3 p.m. Links to live coverage will be available at GoZags.com. SPOKANE, Wash. — Gonzaga baseball took a 6-2 lead into the eighth inning, but an Oregon rally gave the visitors the win, 7-6, on Monday night at Patterson Baseball Complex and Coach Steve Hertz Field. Gonzaga (17-15) gave up a two-run homer in the eighth and then a go-ahead three-run homer in the ninth to the Ducks (22-13) after grabbing the lead with a four-run fourth inning. Guthrie Morrison and Josh Bristyan each had multi-hit games, while Nick Nyquist and Austin Pinorini did damage with the long ball. Morrison had three hits with a double and an RBI, while Bristyan had two hits with a triple and a run scored. Nyquist and Pinorini each homered in the game. On the mound, Nick Trogrlic-Iverson turned in a solid 5.0 innings, allowing just two runs on four hits with four strikeouts. Gonzaga got on the board first with an RBI groundout by Pinorini in the first, but Oregon came back with a run in the second and another in the fourth for a 2-1 lead. That's when GU had its big inning, posting four runs with four extra-base hits for a 5-2 lead in the fourth. Pinorini hit a solo home run and then Nyquist rocketed his homer out to centerfield to score Harris, who had reached on a double. Josh Bristyan then tripled and later scored on a squeeze bunt by Slade Heggen. Trogrlic- Iverson settled in for the fifth to finish his night and then handed the ball to Trent Schulte, who kept the Ducks scoreless in the sixth and seventh. In the eighth, Oregon closed to within two runs after a two-run homer made the score 6-4, and then UO got its go-ahead homer in the top of the ninth. Gonzaga put runners on second and third with two outs in the home half of the final frame, but a diving stop at second base sealed it for the Ducks. Gonzaga will be back on the road this weekend at Santa Clara, beginning Friday at 6 p.m. Links to live coverage will be available at GoZags.com.